Sometimes a year is a time long enough to bring about profound changes. This month last year, an untoward incident had occurred that shattered illusions of normality and peace and brought to the fore the climate of political hostility and combativeness. Today, the environment is that of reconciliation and peace. With such a Janus-faced nature of politics at play, cynics among us can only heave a sigh of helpless resignation and feel indifferent. Maleth is a village located at the outskirts of Rajbiraj. In its proximity lies an industrial area built in 1986 with India’s assistance, now called Gajendra Narayan Singh Industrial Area. 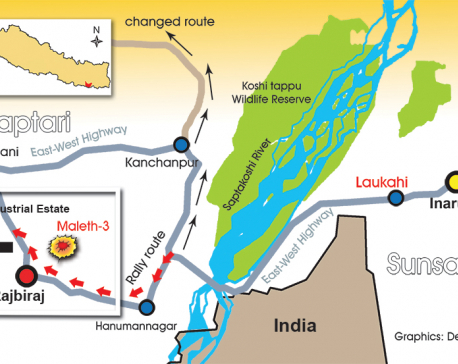 This industrial corridor that was supposed to be a lifeline of development of the local area is a picture of sheer neglect and represents everything that is wrong with Nepal’s development process—a huge tract of land acquired, number of buildings constructed but never got started due to lack of political will. On March 6, 2017, a bloody incident occurred inside the industrial area that catapulted Maleth to the national news headlines. 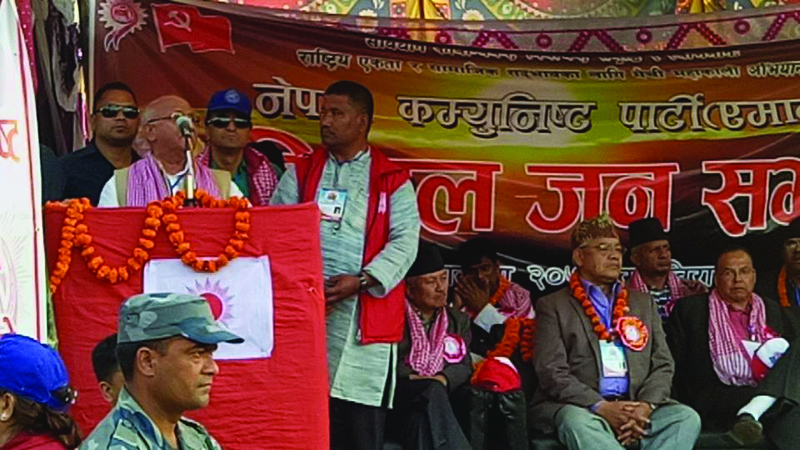 A couple of months before the first phase of local elections, CPN-UML embarked on Mechi to Mahakali campaign in a bid to ‘bridge gap with Madhes’ that had broadened in the wake of constitution promulgation process in 2015 due to the heavy campaigning of Madhesi Morcha against UML in particular and the indiscriminate killings of Madhesis during KP Oli’s tenure in office. Buoyed by success of its campaign in Itahari, UML’s next destination was Rajbiraj, a Madhesi dominated belt. 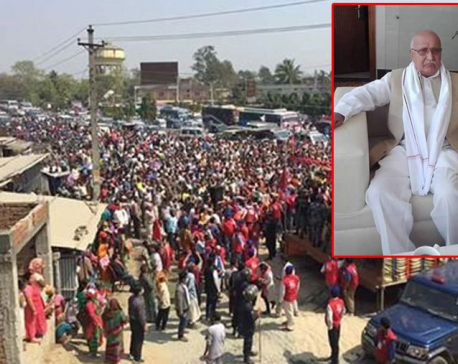 Despite warnings from security officials of the imminent violence, the UML went ahead with the program, shifting venue from Rangshala to Gajendra Narayan Singh Industrial Area in the outskirts of Rajbiraj. The UML came along with its top leaders and more than 3000 apparatchiks. About 1200 security forces were deployed at the site. As per the reports, there were about 500 party workers of Morcha protesting there. The tragedy occurred at the end when K.P Oli was about to finish his speech, with police firing killing at least five people and leaving dozens injured. This resulted in imposition of curfew and spate of violence. Later, it was reported that people killed had no affiliation to either UML or Morcha. Contradictory stories were floated by the UML, Morcha, security forces and eye-witnesses about how the mobs became unruly and police resorted to firing. There were mainly two triggers to this fateful event. First, Morcha wanted to foil the campaign because it had faced the similar resistance in 2015 when its campaigns were thwarted in Itahari and Rangeli, Morang supposedly by UML cadres and youth wing. Second, Morcha had successfully consolidated their vote bank by painting Pahadi Khas-Arya as evil. The atrocities of the security forces that led to the death of about 60 people only vindicated their stance. Morcha wanted to pose a strong response in its bastion to UML which is perceived as the party of ‘Pahadi Khas-Arya’ people as a sign of resistance against the ‘enemy’. Bimlendra Nidhi was the Home Minister in the NC-Maoist coalition government led by Pushpa Kamal Dahal. The CDO and SP were instructed not to open fire unless the situation turned dire as admitted by an officer later. 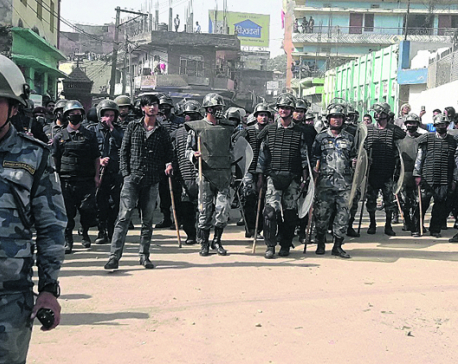 One grievance Madhesis harbor against the establishment is that police is always quick to open fire on them at the slightest provocation, even when the situation could have been contained by lesser means. In Maleth, security forces outnumbered protestors but still resorted to firing to control the unruly mobs. These killings took a communal color since the protestors blamed the ‘pahadi police’, in reference to its unrepresentative character for suppressing the protest. As a result, ‘pahadi versus madhesi’ dichotomy was constructed which can be manipulated to have dangerous consequences. Nidhi quickly called back the CDO and SP after the incident and sent new officers in their place. He later apologized for the incident and on behalf of the government recognized the dead as martyrs and offered one million rupees to the family of each deceased. His actions were perceived as ‘weak and insufficient’ by Madhesi people. There is a widespread feeling among Madhesi people that Madhesi leaders in ‘pahadi’ parties like NC, UML and Maoists are consigned to the inferior positions. They believe that Pahadi officers in senior positions often defy Madhesi leaders in ministerial positions or simply refuse to cooperate. In Maleth, SP was believed to defy orders from Home Ministry. This event caused grievous damage to Nidhi’s aspirations in the run up to the parliamentary elections where the NC stalwart from Madhes was toppled by an ‘outsider’ Rajendra Mahto in his own constituency. Few days later, when Morcha leaders visited Maleth, thousands of people thronged. There was a huge emotional outpouring and a feeling of dejection among Madhesis for being maltreated by the system. The craving for belongingness to ones’ own land was palpable. This created immense pressure on Madhesi parties that were fragmented, to unite. As a result six of the seven Madhesi parties came under a common umbrella of Rastriya Janta Party Nepal (RJPN). The ruling alliance of NC-Maoist mellowed down a bit, recognized genuine Madhesi grievances and showed intent to amend the constitution to include Madhesi demands but failed to garner two-third majority due to lack of support from UML which called the amendment India’s agenda. Maleth incident remains etched in memory of those who witnessed it firsthand. Though it was supposed to be a symbol of resistance of the oppressed, the death of innocent people reduced it to an act of naked violence and showed the proclivity of the state and parties to indulge in internecine conflict. The bigger question it posed is how weak our social fabric is and how prone to manipulation it is by extremists and egomaniacs. The event created a deep-seated angst among Madhesis, especially youths who swarmed to vote for Madhesi parties, not because they saw these parties as part of solution but because they viewed NC and Left Alliance as sinister. Prime Minister K P Oli, Pushpa Kamal Dahal and Upendra Yadav are no visionaries. They are opportunists who have made their political careers by propagating divisive agendas. Thus the talks of stability and economic prosperity sound like a ploy to divert attention from issues of bridging social gaps. At this moment, it is important to unravel our past and negotiate with it with open mind.